Happy 2019! 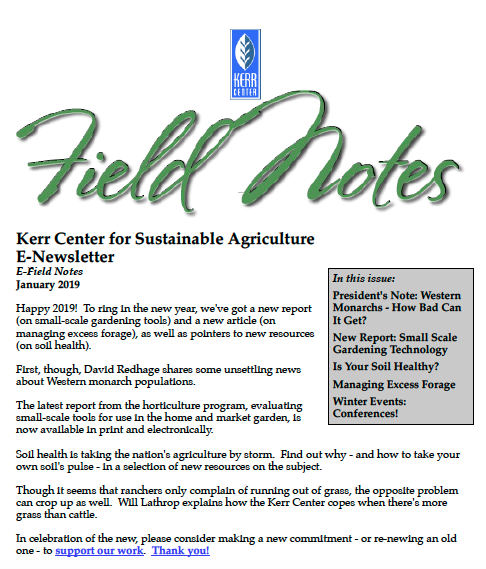 To ring in the new year, we’ve got a new report (on small-scale gardening tools) and a new article (on managing excess forage), as well as pointers to new resources (on soil health). First, though, David Redhage shares some unsettling news about Western monarch populations. The latest report from the horticulture program, evaluating small-scale tools for use in the home and market garden, is now available in print and electronically. Soil health is taking the nation’s agriculture by storm. Find out why – and how to take your own soil’s pulse – in a selection of new resources on the subject. Though it seems that ranchers only complain of running out of grass, the opposite problem can crop up as well. 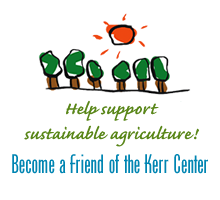 Will Lathrop explains how the Kerr Center copes when there’s more grass than cattle. White-nose syndrome has been confirmed for the first time in Oklahoma, making it the 31st state with the deadly disease that affects hibernating bats. Bats play an important ecological role; each bat can eat up to 3,000 insects, including mosquitoes and agricultural pests, in a single night. Biologists are concerned about how white-nose syndrome will affect the bat populations in the future.